Fording the River Clun in a Bentley feels odd. Getting a Bentley covered in mud, odder still. It feels disrespectful. Watching axle-deep muddy water sluice through 21-inch wheels from the comfort of a hand-stitched, quilted, heated, and massaging seat, whilst at the same time listening to the morning news on an 18 speaker digital audio system with a £6,300 price-tag is, for a working class boy like me, surreal to say the least. It is by no means the usual start to an average day. The Bentley Bentayga though is by no means your average Bentley – if such things exist of course. Weighing in at 2,450 kg, and packing an all-new version of Bentley’s 6.0 litre, twin-turbo, W12 petrol engine it towers above nearly everything else in its path. Its all-season tyres are nearly a foot wide; it produces 600 bhp, 664 lbft of torque, it’ll dash to 60mph in just 4-seconds; where allowed it’s capable of 187mph; it’s got eight driving modes, four for on-road and four for off-road; and if you drive it carefully you might just get a range of 400-miles before you need to quench it’s thirst with 18.7 gallons of super-unleaded. 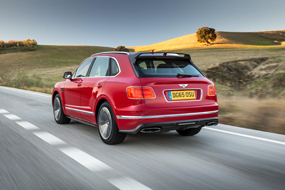 If you’re in the market for a Bentayga the cost of a fill-up probably won’t bother you though. At £162,700 before options – “mine” cost a mere… say-it-quickly, it’s more than my house… £203,560 – Bentayga customers I assume already own their own oil-field. Or should that be oil-fields? Due to its sheer size, and as a result of all that power, you could easily be forgiven if you expected the Bentayga to make very loud noises and handle like a rhino on a water-bed. It does the opposite in fact. Whatever the gear, and whatever the road conditions, there’s barely an under-bonnet murmur. The ride too is near magic-carpet smooth, thanks in part to ‘Bentley Dynamic Ride’ – an active roll system that utilises 48V electronics rather than the hydraulics – the advantage of which, say Bentley, “is to significantly improve the time it takes to counteract lateral rolling forces”. Just how Bentley engineers (or was it Audi engineers all along? The Bentayga and the Q7 share the same underpinnings) – have managed to control such leviathan loads must surely be the work of witchcraft. No other vehicle weighing this much accelerates or corners with such finesse. They could have blessed it with better brakes though. But I guess 2.5 tonnes travelling at 70mph or, ahem… perhaps a little more, takes some stopping! Such is the Bentayga’s composure it’s only in such situations that you realise just how rapid it really is. What you’re never in any doubt about, though, is just how luxurious the car is. An unquestionable sense of occasion begins as soon as you swing open the weighty driver’s door. Your nostrils are immediately filled with the rich scent of handcrafted leather, polished walnut and stainless steel adorn the dash, and your shoes sigh into deep lambs-wool carpets. 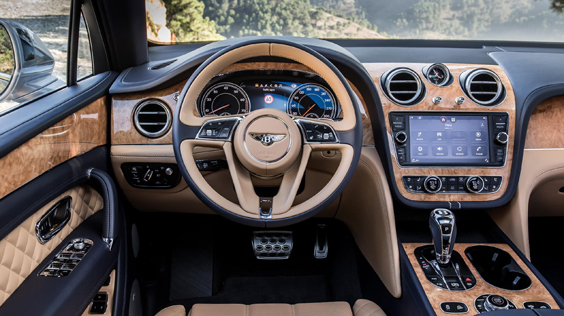 Make no mistake, Bentley make interiors in a way others can only dream about. 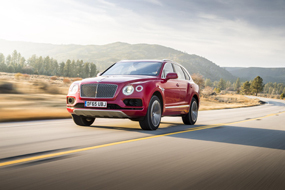 With its mix of undisputed opulence and near unbelievable performance Bentley call their Bentayga, the fastest, quietest, most luxurious SUV in the world. Or as Ettore Bugatti once disparagingly said: Bentley: Maker of the fastest truck in the world. From my heated and massaging position in the middle of the river, as I edge to the Bentayga closer to dry land, I’ve no cause to argue with either.